Should have been love. 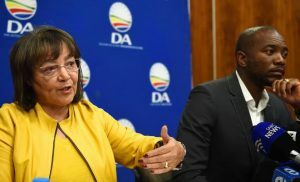 Resigned WC Mayor Patricia de Lille says she has much respect for DA’s leader Mmusi Maimane (right) and that ‘should take control’. De Lille handed over all belongings of the City and fired a salvo:” Its a rudderless party” with no leader- much to the rousing applause from her supporters. De Lille was joined by former councillors of the party who include former chief whip Shaun August, all of whom resigned from their positions and the party last week in support of De Lille. Two more councillors also announced that they too were abandoning ship. “I just wish I can really know who the pastor is. I have respect for him, I will not stoop down to that level that they have stooped to in the party and he allowed that to happen under his watch. My advice to him is please take control of the DA because you are allowing people with their own agendas to be destructive,” she said. Going forward, she indicated she wanted time to reflect and will advise accordingly, without responding on either the resuscitation of her part or joining another party. As we reported on Wednesday, the confusion has been dealt with finish & klaar. Meanwhile, DA remains steadfast that it will go ahead with criminal charges against De Lille.